Play With Pigments – Celebrate with a paint party! What is Play with Pigments? We are an art and party studio. 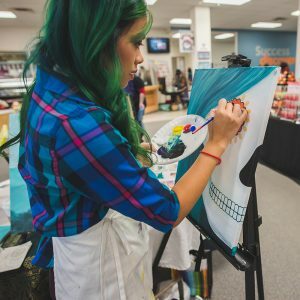 We provide the art supplies and instruction for you to explore your creativity in a fun and relaxing environment. Bring a friend and follow along as Makara walks you, step-by-step, through replicating that day’s featured painting. No experience necessary! Classes run for approximately 2-3 hours with breaks sprinkled in. Sometimes we have so much fun that we go a bit past our scheduled time, so please allow for some flexibility. You will leave with a painting that is uniquely yours, and we guarantee you will be amazed at the artwork you will have created. We provide all the painting materials, just come ready to have fun! Depending on the location, you can even bring your favorite beverages and snacks! Please refer to the event details regarding food and beverage circumstances. We are so excited to “play with pigments” with you! Just follow these simple steps and get your paint party on! Select a painting on our Events Calendar. We have paintings of all sorts, so there is something for everyone! Reserve your spots (invite your friends). We accept all major credit cards and PayPal when applicable. Can I host a private party? Please read our guidelines regarding hosting a private party here: Request Private Party. I purchased a ticket, but cannot attend. What is your return policy? Want art tips and advice for doing your own projects? See what our resident artist is up to at the blog! I am only creative when it comes to photography, but Makara’s birch tree painting was moderately easy. I had my doubts about my skills until the end and I absolutely LOVE the end result so much. She literally walked us through it step-by-step while encouraging us to make it our own work of art. It was such a great night with friends and wine :). I can’t wait to do it again! -Crystal A. Such a fun and educational evening! Ive never painted before and I was so excited about my results!!! The instructor was amazing! I painted with such confidence at her encouragement! I will definitely be doing this again—all my fiends want to paint with me as well:-). -Blair A.
I can’t even draw a stick figure. But I went to Makara’s paint night for the one with birch trees and had tons of fun. And I love my trees even if they are …original! lol. Definitely recommended! -Julie N.
This was so much fun and so so easy to learn!!! I can’t wait to do it again. -Holly C.
Today was my second experience with play with pigments and loved it! Love that we are all taught the same thing and they turn or so different. -Jennifer M.
Not convinced? Read reviews on our Facebook page!